NIACL has released the online Prelims examination result 2018 for the post of Assistant, which was held on 08th of September 2018. 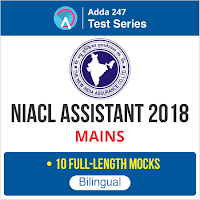 We congratulations to all candidates who got selected for NIACL Assistant Mains 2018 examination which will be held on 06th October 2018. The List of Roll Numbers of Candidates, Provisionally Shortlisted for Phase II Examination for the post of Assistants (Class III)- Assistant Recruitment Exercise 2018 is given below. Note: Downloading of call letters indicating date and venue of Phase II examination will commence shortly. Candidates are advised to keep visiting the Recruitment Section of our website for further details. Marks of all the candidates appeared for Phase I examination will be displayed on our website in due course. All the Best BA'IANS for NIACL Assistant Mains! !